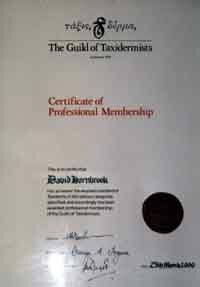 For the best results use a Taxidermist who is a qualified, accredited member of the Guild of Taxidermists, (only 21 in the UK) or a taxidermist who has attained specialist status in your specimen category e.g. : Birds, Mammals, Fish, Head Mounts. Your specimen should be thoroughly defatted, degreased, properly preserved, anatomically accurate and tastefully finished, it will then stand the test of time and appreciate in value. Unlike the work produced by some commercial taxidermists who are reeling poorly preserved work out at an alarming rate, none of which will last or be worth anything in the future. (9 out of 10 taxidermists in the UK have no qualifications).